Khushi Shelat is Chief Ambassador @changemakeher, and the Youth Member for Algester. She is crazy enough to believe the world can be a better place – and that the youth of today are the ones who will make it happen. 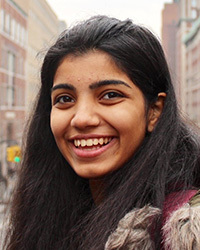 Khushi is passionate about applying technology to solving our world’s humanitarian crises. A proud feminist, social entrepreneur, and ChangeMakeHer hustling to create lasting impact. And, she’s just finished high school.